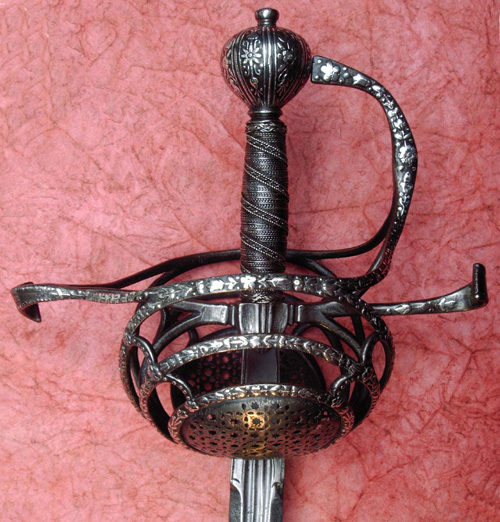 The Rapier is one of the most elegant swords that a collector will encounter. Some pieces truly epitomise the supreme art and skills of the master sword makers of the sixteenth and seventeenth centuries. Prices for the best swords can be astronomical, but this is an area of collecting that can still turn up representative examples that do not break the bank balance. A new collector must be made immediately aware that there are many copies in the market, most notably those manufactured during the Victorian era, ostensibly to fill the great houses built throughout Britain during the Tudor and Medieval Revival period. These will be discussed later. The rapier is first noted during the latter half of the fifteenth century, but only comes into major prominence during the early sixteenth century. It was primarily a sword designed to be worn by a gentleman and not particularly suitable for use during heavy combat on the battlefield. The traditional broadsword was still the preferred weapon of choice in this arena. During its height, rapiers were worn as the ultimate fashion accessory and signifier of rank. Great competition was placed at Court to be the nobleman with the most grandly ornate sword, and contemporary paintings vividly show the wide range of rapiers available to those willing to pay the vast sums needed to purchase such a “trophy” piece. The introduction of a more formalised system of fencing in Spain and Italy (and later, England), further enhanced the allure of the rapier and led to a gentleman’s settling of accounts via the duel, a pastime frowned upon by the authorities, but one that continued well into the nineteenth century. Spain is normally claimed as the first country to have introduced the rapier or espada ropera (dress sword), with Italy, Germany and England following soon afterwards. Sword blades were manufactured in Toledo and Valencia in Spain, Solingen and Passau, in Germany, and Milan and Brescia, in Italy. They would have been sent as un-hilted blades and hilted locally at their eventual destinations throughout Europe. Some blades are maker marked, although many are plain. Notable bladesmiths’ names recurring on rapier blades include PICCININO (Italy), CAINO (Italy), SACCHI (Italy), FERRARA (Italy), JOHANNES (Germany), WUNDES (Germany), TESCHE (Germany), SAHAGUN (Spain), RUIZ (Spain), and HERNANDEZ (Spain). The names of respected bladesmiths were often forged by lesser rivals and it is sometimes rather difficult to know who actually made the blade. There are many differing styles of rapier, particularly with regard to the hilt. The evolution of hilt styles coincided with changes in the manner of combat and the lessening influence of plate armour. Previously, swords tended to be of simple, cross-hilted, cut and thrust form, with protection afforded by an armoured gauntlet. As full armour became less popular, the need to protect the hand became more important. This included the development of a thumb guard or ring to the hilt on early rapiers, leading to the adoption of side rings and later, the typical swept-hilt form most commonly attributed to the rapier. Early blades were of diamond section and extremely long. Some are known to have a blade length of over 40 inches. These early rapiers were designed to be used in conjunction with a left-handed dagger in order to parry an opponent’s blade. The rapier and dagger were normally crafted as a matching pair, although it is extremely rare to find any of these pairs still together. 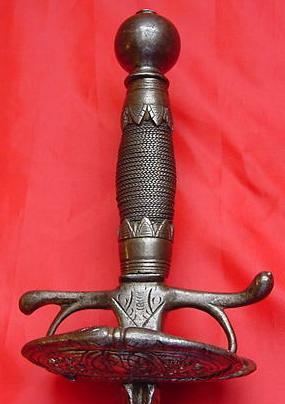 In style and proportions, the dagger was usually a smaller version of the rapier, with sweeping hilt quillons, large terminals, a plate guard and matched pommel. Spanish and Italian left-handed daggers tend to be more elaborate than English and German examples. Right-handed daggers with corresponding rapiers are known, but scarce. As the sixteenth century progressed, blade lengths reduced making the rapier more manageable. Hilt design became ever more complex, with added emphasis laid on protecting the hand. In the 1620’s, we see the addition of more side plates and shell guards. 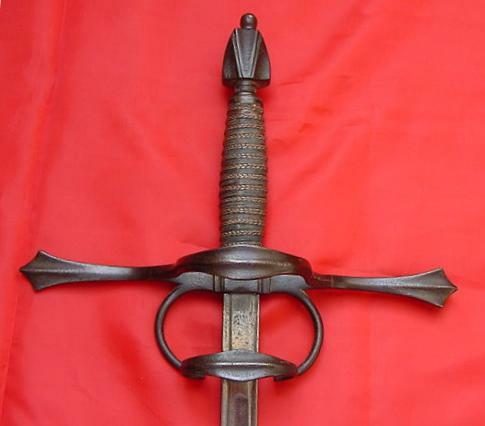 In Gemany, the so-called “Pappenheimer” hilt, named after Gottfried Heinrich Graff Pappenheim, who carried this style of sword during the Thirty Years War (1618-1648), comprised a rapier hilt with large plates and recurved quillons. It was very popular in the Low Countries during this period. In time, the natural desire for more hand protection culminated with the design of the cup-hilt rapier. This featured a large bowl guard with pierced or scalloped shell decoration. It proved more popular in Spain and Italy, not being particularly favoured in England. Its very “Spanish” styling was probably regarded with great suspicion by this fiercely Protestant nation, although its use in the Low Countries was again frequent. Examples produced for the nobility are very fine, with exquisite chiselled hilt work in chased silver and gold. They very much represent the epitome of Renaissance craftsmanship. The demand for authentic rapiers has always been very high. Consequently, the market has had to contend with a large number of fakes or copies. As intimated earlier, many of these are not true fakes, in the sense that they were not originally produced to deceive, but in the hands of some unscrupulous or ignorant individuals, they are sold as the genuine article. Most are Victorian in date and manufactured to keep up with the demand for “antique” weaponry displayed in the new baronial or great houses. As many are well over a hundred years old, and probably uncleaned, they have now taken on the appearance of an antique sword, with appropriate wear, patination and pitting. Although the Victorian craftsman was noted for his metalworking skills, it is true to say that when compared with the original, there are a number of clear differences. At a basic level, the copies do not have the correct appearance of proportion. Hilt and blade lack the graceful lines of the period pieces, with the hilt bars tending to be over-sized and thick. Blades are also too heavy and completely un-balanced. Victorian examples were manufactured in age of machine tools, rather than the hand-wrought nature of the original. The Victorians also “made up” rapiers with parts (particularly blades) from genuine swords, combined with new hilts and pommels. This can make the task of identification even harder. If you are buying a genuine rapier for the first time, it is very wise to ensure that you purchase from a source that can verify in writing and so guarantee, the authenticity of the piece. Reputable dealers and auction houses are therefore your recommended first port of call. Please note that if a rapier is described in an auction catalogue as “in the style of”, then it is definitely a copy.